The website has unique design aimed at attracting and maintaining visitors, whilst allowing Levante full control through the use of our Content Management System. 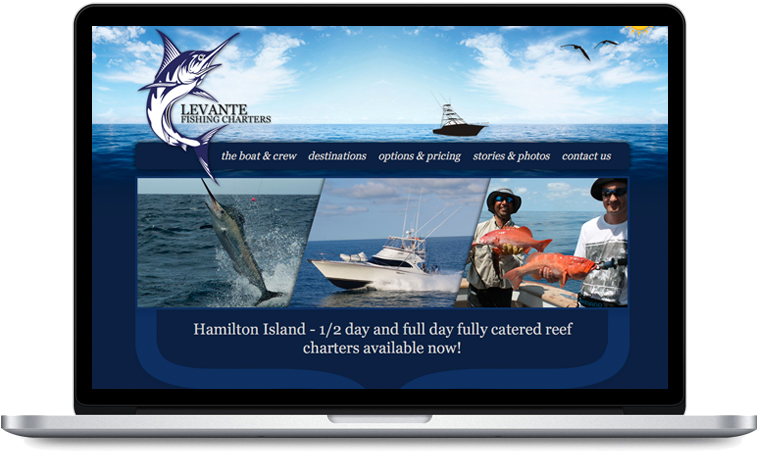 To rebrand Levante Fishing Charters logo and website with a new functionality. It was essential to bring Levante's brand to life and convey the powerful message of Big Game Fishing whilst embracing the reef charter aspect of the business. Our approach was to have a strong logo with a powerful symbol of the sea - The Marlin that is recognisable almost anywhere. We also worked on integrating a weather module which will display live weather updates from the current location of the boat. We launched Levante Fishing Charters website in May 2013 and we have received great positive feedback from the client.